With the Wakefield show being just over a week away, teasing photos of a possible new RISC OS powered solution have arrived at drobe.co.uk HQ this evening. The pictures, shown below, show a new machine in quite a sturdy yet shockingly radioactive orange coloured metal case that sports a RISC OS 4 licence sticker and several interesting looking connection ports. A Windows less machine, perhaps? Your guess is as good as ours. The photos, which show a machine labelled as the 'A75', originated from Stuart Tyrrell Developments, who also sell the A6 Windows-VirtualRPC PC. More details expected soon, although it's good to see that STD can afford such glamorous models and photo shoots these days. Incidentally, RISCOS Ltd., developer of RISC OS 4, today added Advantage Six (also known as STD) to its list of authorised manufacturers, commenting, "Advantage Six Ltd will be using both full versions and special 'embedded' versions of RISC OS in its future products." Advantage Six have said they'll be working closely with RISCOS Ltd. to develop new products, the first of which will be ready for Wakefield this month. Surprise, surprise. It looks like it has a PC "game port", which says to me it's a PC clone with a copy of Virtual Acorn, but I could be horribly wrong. That's a really nice size for a machine. Even better if you get choices of colours! I would probably choose Phoebe Yellow (TM). If it is Virtual RPC, it would be cool if it's running on Linux - this being the most obvious choice of OS if it is not running on Windows. Disclaimer - This message is posted on Drobe Comments and may not be used elsewhere without asking nicely blah blah, spelling/grammatical errors a result of late hour and are to be expected. Just how talk are those Lego men??? Looks like a very compact case. With a colour like that it can't help but draw attention to itself Something we need more of! "If it is Virtual RPC, it would be cool if it's running on Linux - this being the most obvious choice of OS if it is not running on Windows." Oh get over it - Linux VRPC is not going to happen [at least not for a very long time] Jesus! It has certainly got a PC Game Port, but as it's above rather than beside the audio ports, it doesn't look like a PC card. Moreover, this type of port has been around for MIDI for years; see the Audio Dynamics cards. If it is a PC, it's a very weird one, as there are no USB ports visible at all, just a couple of PS/2 jobs. And where does the electricity go in? Sorry for the repeat; NetSurf didn't reload the page properly after the "comments being added" bit. If you look carefully in the 1st picture you can see 3 atx format audio connectors below the audio port - looks like an A6 in a different case to me. Looks not quite as nice as mine!! Pearl white clamshell with real RPC mainboard. Wait and see. STD doing yet MORE products and still, well over a month since announcing UniPod, have not managed to ship those. This will be vapournonsense too. Looking at the length of the case (compared to the width) This looks quite big, the lack of power connector is interesting, batteries? From the headline, I thought this might have been a new Caslte A7000 replacement - perhaps Xscale based, but losing the podules and PCI for an all USB 2 thing. Pah! I would buy one of those. 7500 chips are the future, though. Who could deny that? >Nothing special: STD is going to sell Simtec EB7500ATX evaluation boards in a colourful case. An A11 would be special: [link] Than they have done something MicroDigital should have done. My guess is also that it is some STD / Simtec collabiration in a small rugged case (probably made to meet a clients specific requirements). If it turns out to be simply a off the peg wintel PC running Virtual Acorn I will be very disappointed. It's quite obvious it's the Simtec board - I noticed as soon as I saw these photos. Compare [link] with [link] and it becomes so obvious. I imagine it's in a tough case for STD because the Simtec ARM7500 board is so difficult to kill. Maybe this is based on Simtec's own new Xscale board and RISC OS Ltd have doubled their already strident efforts to bring a hardware-abstracted 32bit ROS to market in time for Wakefield. Money for old rope? STD on the ropes? It's a very amusing and creative 'tease'. Full marks to STD! Naughty Chris.....not suppose to release this info this early. I wonder which market STD is aiming for? Hmmm bright orange, rugged box, blues ropes. These are all clues. Who uses blue ropes and I'm not talking about a Soup Dragon and Clangers? The only new hardware we really need at the moment is a portable RISC OS solution. I believe a well specced portable would outsell the desktop option - and is prefect for RISC OS/Xscale. ATM it is Intel who are doing the right stuff with Centrino - but a RISC OS solution would be *very* attractive. Without this Virtual RISC OS will soon exceed the use of real hardware. There's no USB port, it is laid out just like the RiscStation connectors. If it's a PC where are all the ventilation holes! And how have they fitted in the CPU? So my money's on it being possibly a RiscStation board, or perhaps something updated, but with it being RO4 I'd hesitate to say that it could be XScale based. The NC was done by Acorn years ago so I shouldn't expect they'd just do a RiscStation in a small box. As for power maybe you shake it for 5 minutes and it works for half an hour? See [link] for the relative size (with apologies for linking to someone else's image). And note the same layout, and the presence of the activity/link LEDs on the network port. And don't PCs normally have 2 serial ports, not a serial and a 15pin video? My money's strongly on a RiscStation type or variant, rather than a PC. Quatermass wrote: "I wonder which market STD is aiming for? Hmmm bright orange, rugged box, blues ropes. These are all clues." Bright orange ? Blue ropes ? Nope I can't work it out ! Who is it ? Am I being dense ? > and RISC OS Ltd have doubled their already strident > efforts to bring a hardware-abstracted 32bit ROS to > market in time for Wakefield. :rolleyes: And I'm a little pink pig called Jeremy. RISC OS Limited's whole business stratergy is devoted to 26 bit RISC OS. Changing horse in mid-stream now for them would be suicidal. Good luck to them. Someone needs to keep the old technology going. john: PCs don't necessarily come with 2 serial ports. PC manufacturers are generally trying to retire RS232 and rely on USB, the PC I'm using at the moment only has one serial port. The size would certainly suggest it isn't a wintel PC, as these generally need a greater height for the CPU heatsink and fan, plus clearance for air. I would have thought that, as others have said, it is probably built around Simtec's ARM7500 board, it would make sense. 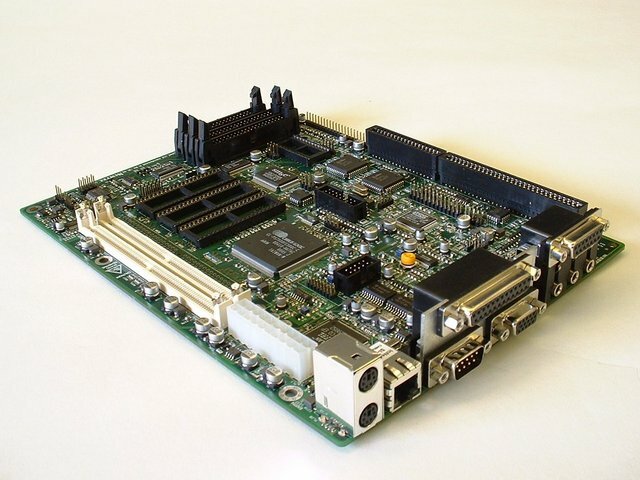 Feel free to mod this post down if you want but, It would appear to be using the same / similar board as the RiscStation Lite in a smaller less expandable case, albeit an orange one! I can only hope that ST Developments have identified a new market for this, since no-one bought the RiscStation (or at least, not many). Still, I'm hoping to be surprised by it and look forward to seeing it in the flesh (so to speak). Cheers!